Bali Hotel Thai kingdom cradle high level resort group that opened in March, 2008, “Anantara” comes to Bali! 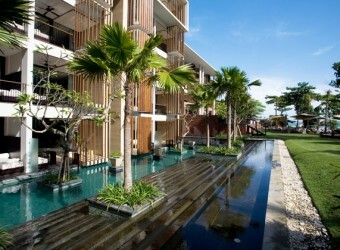 Anantara Seminyak locates on the right side of Sofitel Seminyak, walk to the beach along with Abumanyu Street. It is the best location that you can see the ocean in front. There are plasma TV, and broad band internet in the room. The Rooftop Bar is Great! It`s very beautiful inside, it`s like a five-star hotel. I`m impressed by the rooftop bar overlooking the beautiful sea view. There is a wide selection of wine available here, I had a drink until late at night.